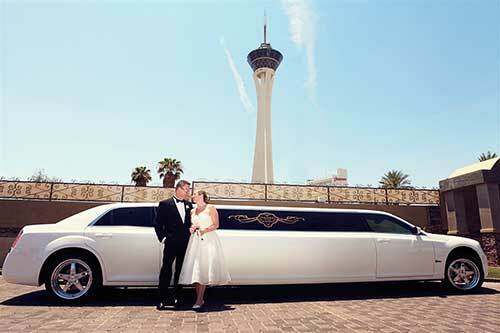 Our elegant and convenient wedding limousine services will make your Las Vegas wedding one you'll never forget! 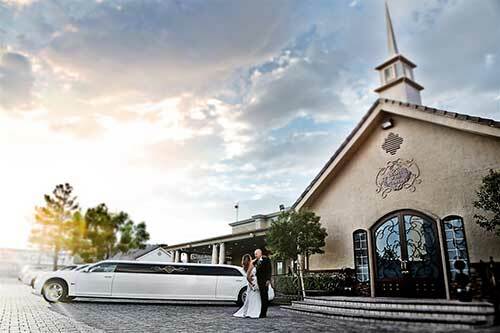 Couples will enjoy a smooth ride in our luxury white stretch limousines on the way to their Chapel of the Flowers wedding! 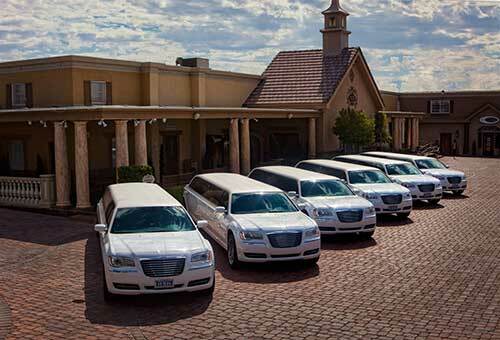 Arrive at your Las Vegas wedding in style! 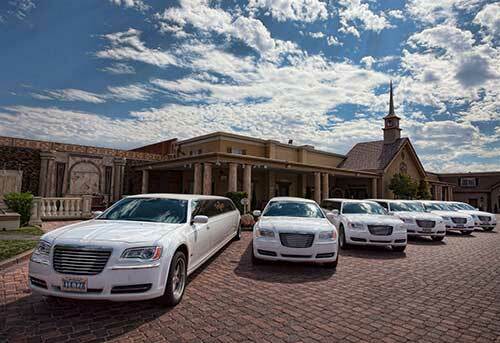 Chapel of the Flowers offers an elite-fleet of luxurious limousines. Our upscale line of 2013 Chrysler 300 super stretch limos provide the utmost comfort while our couples are whisked to and from their ceremony, reception and photo sessions. 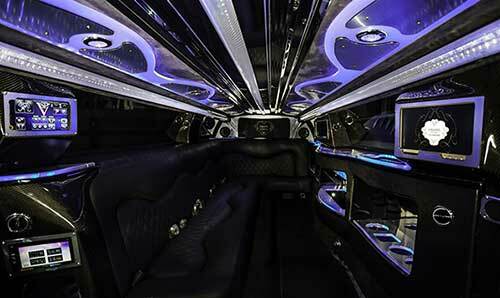 These top-of-the-line limousines seat up to 8, and are upgraded with the best lighting and music packages including four LCD flat screen TVs with DVD players, and custom 20" rims. 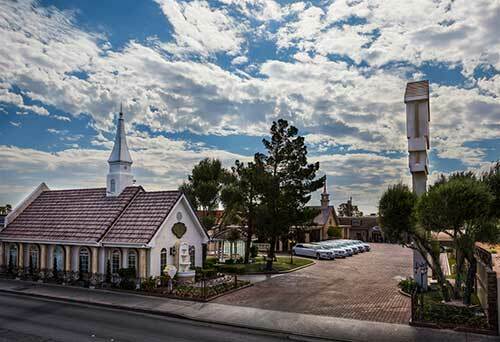 Courtesy round-trip services are included in most of our Las Vegas wedding packages. Pickups can be arranged from anywhere on the Las Vegas Strip, including the downtown area. 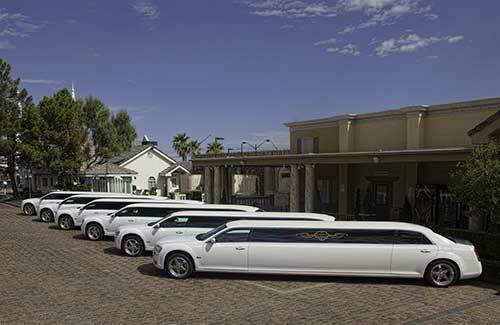 Additional limousine transportation may be arranged for guests, or if you wish to keep things traditional by not seeing your fiancé prior to the ceremony. 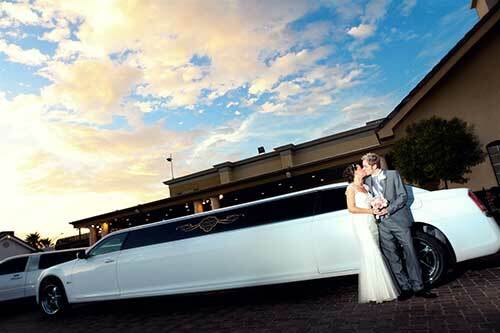 Ask your Wedding Planner about adding limousines or add Deluxe First Look option to your plan. Travel to your Photo Viewing Appointment in a comfort! The photo memory transportation service includes round-trip service from your hotel to your Photo Viewing Appointment. This transportation service also an extra Photo CD copy with purchase of Photo CD. Available Monday - Friday, 10:30 AM - 2:30 PM & Saturday, 10:30 AM - 12:30 PM. (Driver Gratuity not included in service price) Available Monday - Friday, 10:30 AM - 2:30 PM & Saturday, 10:30 AM - 12:30 PM. Also includes complimentary bottled water for couple and an additional copy of Photo CD with pre-purchase of Photo CD or purchase of Photo CD at Photo Viewing Appointment. Driver's Gratuity is not included. We suggest $25.00 or more. Get you and your guests to your ceremony on time in a Hummer limo. This 14 passenger transport will provide round-trip services to Chapel of the Flowers. Your wedding planner will arrange the round-trip service and provide you with all the details. You can also arrange for airport pick-up/drop-off (if needed), ask your planner for more details. Need a ride? Take the hassle out of having your guests find their way to the Chapel by booking this 26 passenger limo bus. Your wedding planner will arrange the round-trip transportation and build your custom quote. You can also arrange for airport pick-up/drop-off (if needed), ask your planner for more details. 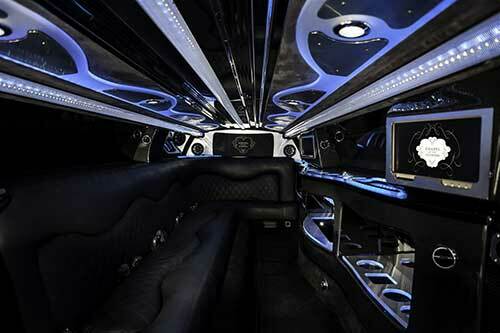 Your guests will arrive in style as they pull into our property in this 30 passenger limo bus. Worried your guests will arrive late or can't find the chapel? No worries, let the chapel arrange for your wedding guests to get to the chapel. Your wedding planner will arrange the round-trip transportation and build your custom quote. You can also arrange for airport pick-up/drop-off (if needed), ask your planner for more details. Give your wedding guests the ultimate Vegas wedding experience as they get shuttled in this 55 passenger coach bus to and from your Chapel ceremony. Your experienced planner will arrange the pick-up and drop-off, so you don’t have to worry if you guests will arrive on time. You can also arrange for airport pick-up/drop-off (if needed), ask your planner for more details.